That’s right, tomorrow at 2pm French Time (7am US Central Time) I will be taking the WSET Level 3 Advanced Certificate Exam!! So what is the WSET? 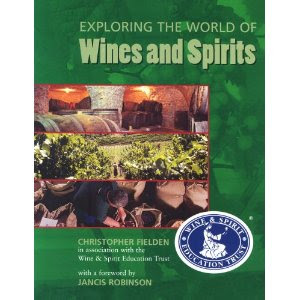 The Wine & Spirit Education Trust, often referred to as WSET, is a British organization which arranges courses and exams in the field of wine and spirits. WSET was founded in 1969, is headquartered in London and is generally regarded as the world’s leading provider of wine education. The courses given by WSET were originally intended for people in the wine & spirit trade, however the WSET programs have increasingly been attended by non-professional connoisseurs. The course content of WSET courses has its focus on general theoretical knowledge of the world of wine and spirits (countries and regions of production, regulations, their style of wine and spirits, grape varieties &c.), and practical identification of beverages and their flavors, including wine tasting techniques. WSET’s courses are also given by a large number of so-called “Approved Program Providers” around the world. 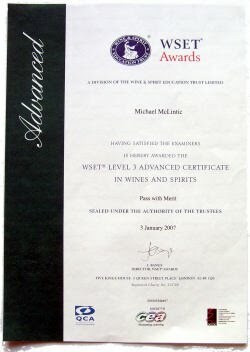 This has made WSET’s course levels the international de facto standard for “practical” knowledge of wine and spirits, outside academic programs of oenology, viticulture, food, technology, and similar subjects, where science and engineering aspects of beverage production tend to be in focus. This has been my bible for the last few months! And hopefully in 6-8weeks, I will get something like this in the mail!!! If you want to see this level in more detail and some example questions from this exam level, click here and view this PDF. The example questions start on page 25. Good luck with your exam, you'll be fine, it's the WSET diploma you need to worry about!